Storytelling World Magazine named her one of the three best storytellers in the world. At least, that’s what the book jacket says (adding that she’s written “several” books). But storytelling is mostly an oral tradition. Could Angela Shelf Medearis create the same magic in a written book? 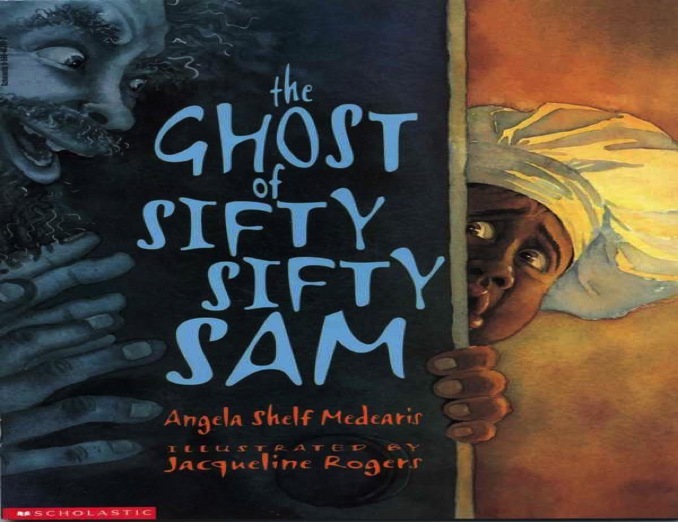 “The Ghost of Sifty Sifty Sam” offers a glimpse of the storyteller in action. She starts with a familiar premise – a realtor offers $5,000 to anyone who can spend the night in a haunted house. She introduces the ghost as a famous local legend, while leaving the details to the readers imagination. (“Old Sam roams around that house every night, scaring anyone who comes into sight.”) And then she creates a sympathetic hero – a local chef who sells batter-dipped fish from a fancy bike-pedaled cart. His name is Dan, it’s a sunny day, and he lugs his groceries into the house. And inevitably, the ghost shows up. But it’s here that the book benefits from its funny illustrations. They create just enough suspense while still making the ghost story comical. Medearis specifically requested the artwork of Jacqueline Rogers, who drew the wild pandemonium in “Five Live Bongos” for George Ella Lyon.. For this book, she keeps things colorful, and shifts to strange angles for her ghost-meets-man story. First she draws a glowing ghost head hovering far in the distance. (“I’m the ghost of Sifty Sifty Sam…” it whispers.) But when it finally materializes, she draws the ghost with wild long hair (along with pale ghost arms, since he’s only wearing a tank top)! It guzzles the pork fatback that the chef had fried in a pan, then moans “I’m the ghost of Sifty Sifty Sam, and I want some more.” The chef cooks a delicious hash out of meat, potatoes, and tomatoes, but the ghost cries for more, so Dan cooks him toast and eggs. One of Rogers’ illustrations is filled with a snaking trail of the cooked foods. There’s a pair of whole chickens (dancing), and a row of French fries.But the foods themselves seem haunted, since each one has a ghostly face. There’s peppers, pies, and potatoes – all smiling fiendishly on their way into Sifty’s mouth! And it’s followed by the book’s most amazing drawing. It shows Sifty’s swollen belly – but it’s transparent, since he’s a ghost, so all the food is still visible inside it! I like how this book flirts with a scary story without ever getting too scary. No, Dan doesn’t get eaten himself. In fact, he’s such a good cook, that he’s earned the ghost’s favor. They live happily ever after, since Dan opens a restaurant and hires Sifty as his dishwasher.